Here at SmartMouth, we use real science to solve a real problem. That’s why the first thing you’ll notice about SmartMouth is that it actually works! Here are real stories from real cutomers who decided to get serious about bad breath. Bad breath is caused by sulfur gas. See how SmartMouth eliminates and blocks smelly sulfur gas for 24 hours. The first step towards overcoming bad breath is recognizing you have an issue. Don’t be embarrassed by your bad breath, get smart with SmartMouth. Learn how you can prevent bad breath for a full 24 hours. The real cause of bad breath is actually sulfur gas produced by bacteria in the mouth. Discover how SmartMouth eliminates and blocks sulfur gas for a full 24 hours. Never have bad breath again! Patients frequently come to me with a pretty personal question. Is there any way to truly eliminate embarrassing bad breath and prevent it from returning? That’s when I tell them about SmartMouth. SmartMouth prevents and eliminates bad breath because our activated mouthwash neutralizes the real source of bad breath, sulfur gas. See how you can be bad breath free. Our new premium zinc ion toothpaste is a different kind of clean feel that lasts. Find the toothpaste right next to all the other SmartMouth products at a Walgreens or Walmart near you. I just want to say thank you for this amazing product. For years I have struggled with dry mouth due to my autoimmune disease. In just 24 hours, I saw a major improvement. Now I feel confident in pursuing my dreams. Your products are truly a lifesaver. I will be a customer for life! 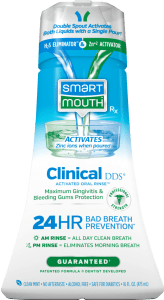 I tried SmartMouth oral rinse and was amazed! It made my mouth feel great with no burn or harsh chemical aftertaste. I suffer from bad sinuses and seasonal allergies which create a lot of drainage and leads to unpleasant breath. I have been using this product for a week now and I immediately see the difference it has made. I am a very frugal person, but I will spend the money if the the product is worth it. I’m definitely a loyal customer now! I love SmartMouth and have been using it for years. As a cigar smoker, it’s important to know that this fantastic mouthwash exists. Now they’ve improved their dispensing system. Awesome family owned company, which I love supporting. You win… I tried to not have fresh breath after rinsing with SmartMouth by eating garlic, onions, fermented beans, pepperoni, and coffee. But my breath was fresh again after an hour of eating those things. I am a fan for life. 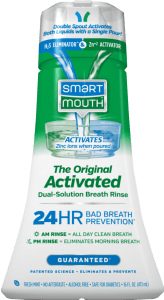 SmartMouth Original Activated Breath Rinse contains a zinc ion solution which activates as you pour to eliminate bad breath instantly and prevents it from returning for a full 12 hours. Reviews are all from actual SmartMouth customers, as a result, statements on this webpage have not been evaluated by the Food and Drug Administration. Results may vary from person to person, however, all SmartMouth products come with our guarantee that ensures SmartMouth will work exactly as described on this website or your money back. This product is not intended to diagnose, treat, cure or prevent any disease.